The size is 23" diameter on top, 98" high, 472" around the bottom. Our mosquito mesh net makes a great bed room canopy or a reading nook. It's decorative as well as functional. 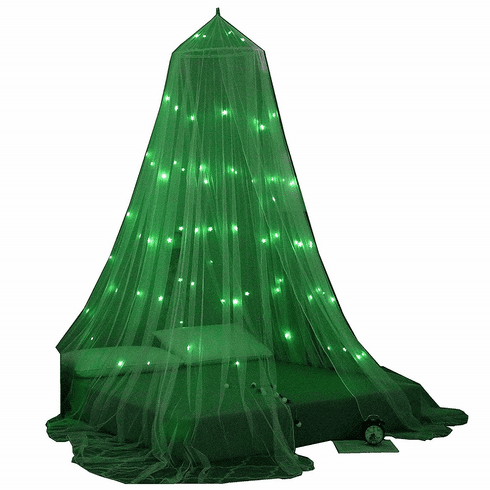 It is a mosquito net which keep other bugs out of bed. It's a a great play canopy as well as being magical to help your kids fall asleep at night by themselves. Made of quality, soft, mesh tulle, drapes nicely and lightweight. There are 76pcs of glowing stars are elegantly placed over the bed canopy body. EASY SET UP: Gently open the folded loop, use the enclosed screw to hang the tent canopy. It fits a twin, full Crib, Queen and king size bed. GLOW IN THE DARK STARS: Don't worry. It doesn't take very much for our stars to glow, even a cell phone light will make it glow. To best appreciate the stars, room must be dark at night.